If there’s one thing that is certain to get people fired up, it’s money. It’s one of the most consistent (and unfortunate) measuring sticks between two human beings. It’s easy to measure because there’s an exact amount and you’re both (usually) earning the same currency. The trouble is, whenever there are those with a lot of money, there naturally follows those with very little. This led to the term management boffins coined as “The Pareto Principle” – colloquially known as the 80/20 rule. It can be applied to a whole series of criteria but it essentially means that, usually, 20% of the causes amount to 80% of the effects. It can be applied in all kinds of places. The workplace (20% of your clients contribute to 80% of your company’s revenue), churches (20% of the congregation give 80% of the tithes), or even tennis (20% of the players win 80% of the matches1). This leads to the age old question of class divides. How can the rich justify having so much, while the poor have so little? And it led scholars to ask: do 20% of the population earn 80% of a nation’s income? I have no idea of the answer, so I did a little research. But Mr Suez’s study didn’t stop here. Keep in mind; this last increase was during the GFC, when markets were crashing all over the world. 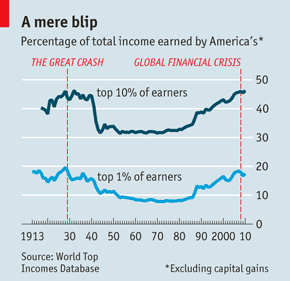 The inevitable conclusion from this data is: the rich are getting richer must faster than the poor are getting richer. Naturally, one of the first reactions to this is “That’s unfair!” How can such a small percentage claim so much more than everyone else??? This gave birth to the Occupy movement and the notion of the “99%”. These folk believe that people who have more money than others hold a disproportionate amount of influence. Their logic (if you can call it that) stems from their belief that all people are equal so should therefore have an equal say. Somewhere in Greece, Plato just rolled in his grave. Wayne Swan, Australia’s Federal Treasurer, has recently taken up the charge by firing several verbal volleys at Australia’s richest people. Namely, Clive Palmer, Andrew Forrest and Gina Rinehart. Mr Swan has been thumping his drum calling on ‘a fair go’ for all Australians and those with more money should not hold greater influence. Unfortunately, these Occupy protesters (and perhaps Mr Swan, I dare say) obviously don’t understand the world we live in. If you earn more money you can buy more things. That’s simply how the world works. If you earn little money, you can only afford a little megaphone. If you earn huge money, you can afford a huge megaphone. It’s simple, but that’s just the way things work. If you can afford to fly business class, why shouldn’t you be allowed to? If you can afford to hire thousands of workers, why shouldn’t you be allowed to? If you can afford your own newspaper, why shouldn’t you be allowed to buy one? Whether things should work this way is, possibly, another matter. But, like it or not, they do. So rather than simply screaming “You make too much money”, we should be asking different questions. Because incentivising generousness is potentially a much more palatable way to redistribute wealth rather than hurling abuse and chanting slogans. After all, I doubt an overwhelming majority of businesspeople would set out with the goal of being 'successful' if they knew they'd have artifical limitations placed on their potential success. Some might state that we should be generous with our money just because it's the right thing to do. Yes, that's a fair point. But history has shown time and again that people are (on the whole) self-interested. By pursuing means to incentivise giving we'll be both redistributing wealth while also promoting notions of hard work and free enterprise. So, how do we incentivise generousness? No idea. But surely it’s an idea worth considering? Perhaps it's increasing tax deductibility of giving? Perhaps it's Government subsidised salaries for those who choose to work for charities? Perhaps it's more public private private partnerships that focus on infrastructure in third world countries? Like I said, I don't know. But thinking of alternatives is always a better way to go than hurling silly abuse, chanting silly slogans, or penning silly essays. 1: Surely it's actually higher than this given Nadal, Federer and The Joker win 99.9% of tournaments? 2: Yes, I read about an economist's work in The Economist. Who knew? I think if more people stopped worrying about what everybody else is doing, stopped wasting time talking about what's wrong with the world and just started doing everything they can to help others, then real change would begin to effect generations and as they attribute wealth they would have an inbuilt moral compass that can't help but consider others. Just a thought, but probably one which is too long term for those looking for a quick fix and who don't really want to be held responsible themselves. One of the issues that upsets Americans is the distortions in their taxation system. This maybe best illustrated by the fact that Warren Buffet is taxed at a lower rate than his secretary.